Burgers have a somewhat undeserved reputation as junk food. It is indeed true that there are some pretty poor examples out there, but that doesn’t mean that we can’t have good burgers if we try. 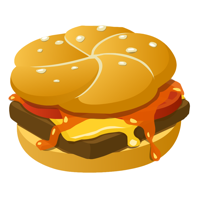 The Lemburger is an important foodstuff in Glitch: it’s not only named after one of the giants, but there’s a whole quest dedicated to making them and then donating the results to Lem. Now, for a giant to have such an insatiable craving for these burgers, we can only assume that they must be pretty good. No fast food here, these are real burgers. Burgers fit for a giant. There are many ways to make a burger, and so many of them are overcomplicated and just plain wrong. The Lemburger has only a handful ingredients, and simplicity is key. If you start messing about adding things to the patties, or trying to cram in too many toppings, you’ll end up with an inferior result. A small number of good quality ingredients is the only way to get the perfect burger. Let’s take a look at those ingredients, one by one. The bun. We covered buns in a previous post, and the sourdough buns shown there are perfect for this. If you don’t want the hassle of making your own buns and plan to buy them from a store, please be sure to get decent quality bread. We don’t want any of those pappy white dough balls covered in sesame seeds here. This is going to be a quality burger; find some decent bread. The meat. Our burger is going to be made with meat. Just meat. Nothing else. We’re not going to adulterate it with any of that stuff that people put into burgers in an attempt to make them more interesting. No chopped onions, no herbs, no added egg to bind it all together. Just pure, unadulterated beef. There’s plenty of debate about what the best cut to use is, and there’s a case to be made for many cuts. Here, I’m going to recommend rump steak. 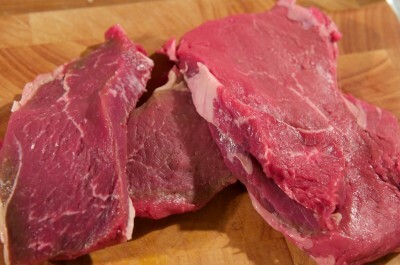 It’s easy to get hold of, it has good texture and about the right amount of fat. Again, use good quality steak. Don’t use the cheapest meat you can find – cheap meat is cheap for a reason. Go for the good stuff – it’ll be a little more expensive, but the animals will have had better lives, and it will taste dramatically better. Organic, grass-fed and properly hung would be perfect. Cheese. A little melted cheese is the perfect topping for a burger, but once again, too many burgers are spoilt by the use of inferior ingredients. There’ll be no synthetic yellow-orange plastic gunk on our burger, what’s needed here is a good mature cheddar. Hint: if your cheese comes in pre-packaged slices, you’re probably using the wrong stuff. Tomato: Again, use good tomatoes. So many supermarket tomatoes are completely devoid of any flavour whatsoever – if you’ve ever tried growing your own, you’ll be fully aware of the difference. Small independent greengrocers and farm shops often have better produce than the big supermarkets, use those if you can. Sauce: A little relish never goes amiss. Now, the Lemburger specifies Hot ‘n’ Fizzy sauce, but we haven’t covered that particular recipe yet – we’ll deal with that in a future post – so for now we’ll just improvise a little. For this recipe, I took two of my current favourite sauce/relishes: What A Pickle’s Tomato Chilli Jam, and Mr Singh’s Hot Punjabi Chilli Sauce. Both these are excellent on their own, and combine together beautifully. I suggest here, you try something similar, and find a good quality tomato relish, and a good quality chilli sauce, and blend the two. I don’t recommend Tabasco or other similar sauces here – they’re a little too vinegary for this kind of thing. So, with all that in mind, let’s get to the recipe. Mix some of the tomato relish and chilli sauce together. The amounts needed here will depend on which particular sauces you are using – you’ll need to experiment a little. You should be aiming for something which retains a good tomato flavour, but with a decent kick from the extra chilli. Take the steak and chop it reasonably finely. The best way to do this is by hand, with a sharp knife. If you must, use a food processor, or a mincer, but chopping by hand will give you far superior results, I promise. It’s nowhere near as hard as you might think, and there’s way less washing up to to do once you’re done. As you go, trim any gristly bits or excessive pieces of fat, but don’t remove all of the fat – you need some in there to help keep things moist. Now, this bit is very important. Do not, under any circumstances whatsoever, add any salt to your meat. The salt breaks down some of the proteins within the beef and will dramatically affect the texture of your finished burger. 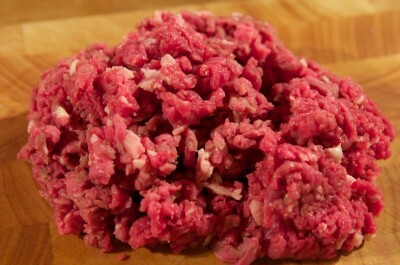 Never add salt to the chopped steak, only ever season the shaped patties immediately before cooking. 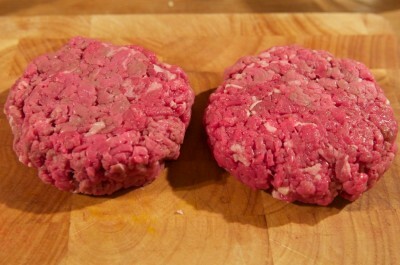 Form the steak into round patties, about one inch thick, one per person. Once you’re ready to cook the burgers, sprinkle each side with salt and freshly ground black pepper, and place them straight into a hot frying pan. You can, of course, use the grill here if you prefer, but I think the pan gives better results. Cook the burgers until done to your liking, flipping a couple of time during the process. I like them so that they’re just pink at the very centre – you can do yours more or less depending on personal taste. Once cooked, remove from the heat for a moment to rest, and cut the buns in half and toast lightly under a hot grill. Lay each burger on the bottom half of a bun, and lay a couple of slices of tomato on top. Then place a slice of cheese on top and place under the grill until the cheese is just starting to melt. Remove the burgers from the grill, place a generous spoonful of the tomato/chilli sauce mix on the top and cover with the top half of the bun. Serve with some salad on the side. You can serve with fries if you like, but these burgers are pretty substantial and rather filling in their own right. Over the years, I’ve made (and eaten) a fair few burgers, and I have to say that the ones I made for this post are amongst the best I’ve had. It’s well worth taking the the extra time and effort to do these properly, they were utterly delicious. If this has whetted your appetite for burgers and want to learn more, I can thoroughly recommend Serious Eats: A Hamburger Today - a very comprehensive web site that will tell you everything you ever wanted to know about making burgers, with plenty of tips and recipes to try out. 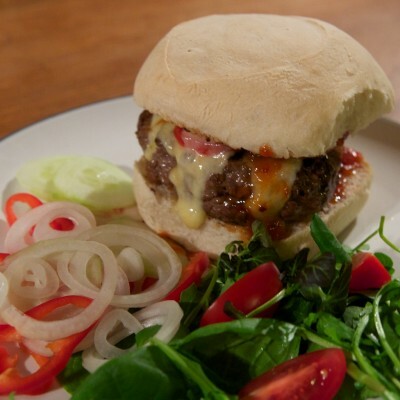 This entry was posted in Meals and tagged bun, cheese, hot-n-fizzy-sauce, lemburger, meat, tomato by dopiaza. Bookmark the permalink. What a delicious looking hamburger and an awesome idea for a blog!